There is time in my life when I just have to look for whatever available in the house, and throw them all together for a meal. This week was one of those moments when I created the dish below. 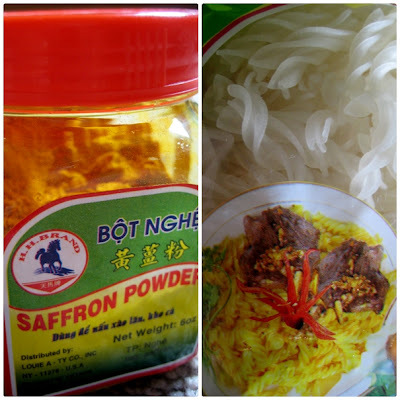 I have a bag of this twisted rice noodle, and saffron powder! I cooked the noodle according to the direction on the bag. Then added enough saffron powder to give the noodle the desired color! Sweet bell peppers of different colors were also available, and very affordable at this time of the year. I cut them in lengthwise. I stir fried some shrimp and squid pieces with salt and black pepper to taste along with sweet bell pepper. 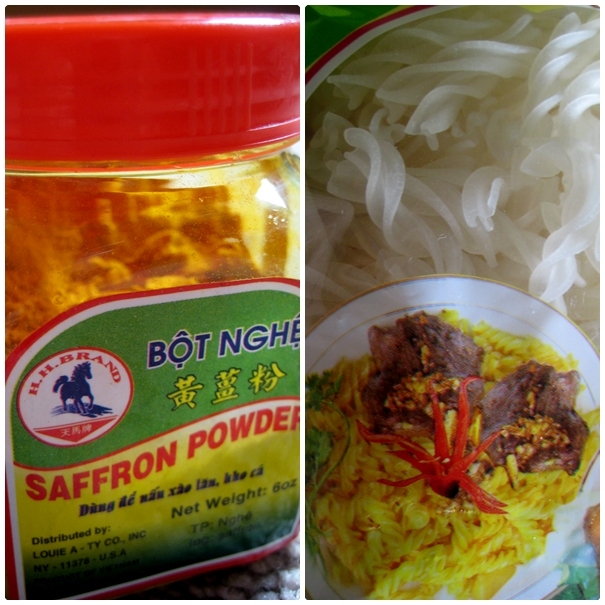 Then fold in the saffron noodle and give it a quick mix. It turned out quite scrumptious, and you can easily adapt this dish anyway you want such as replacing the shrimp/squid with beef, chicken or pork pieces! Mix and match different vegetables with whatever you have in the house. The main point here is that you can feed your family delicious and healthy food without going over budget. I love recipes that I all Formula Recipes~ ones that can morph into so many delicious dishes. Wonderful looking dish and gorgeous pictures! YUMMY! It looks pretty good. I've never had shrimp though, so I might put something else in. Icy, this sounds scrumptious and I'm betting would be fantastic with pork. Love bell peppers so I will try this one. Thanks for Sharing it. This looks absolutely delicious to me! yesterday was my son's birthday. I cooked black pepper shrimps. I don't cook saffron noodles but rice. And you can cook too...wow! Red peppers never look so good. I haven't been coking much lately, missed it. You wouldn't have a complaint from me with that dish. I LOVE squid. There's a Japanese restaurant up the street that has whole grilled squid for just $6. I could eat it every day!